Kids losing teeth - how much does the tooth fairy pay? Last week Heidi (aged 6) lost her very first tooth. It had been wobbly for weeks and she was desperate for it to fall out. In the end, it was hanging on by the tiniest thread and she took the rather extreme method of asking her brother to punch her in the face!! Crazy but it worked! Might I add the kids were upstairs and supposed to be in bed sleeping when this happened. I know the tooth fairy sometimes pays extra for a first tooth and have heard stories of some children receiving £20 (I kid you not!). Heidi wasn't so lucky though but in the morning was still delighted to find a shiny £1 coin under her pillow. 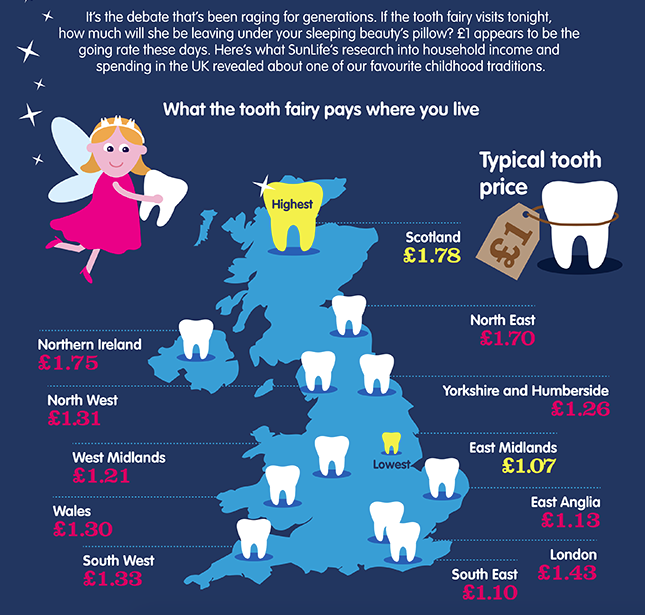 I was interested to read this research from Sunlife which states that a typical tooth is worth £1 to the tooth fairy! Phew! Although based on where we live, the tooth fairy may have been feeling the pinch last week as the North East's usual going rate is £1.70 (don't tell Heidi this). The research also discovered that surprisingly London kids get the least from the tooth fairy - I would have expected more from our capital! Where as children in Northern Ireland and Scotland seem to receive the most. I try not to get caught up in what other parents do and just concentrate on us but I have to admit, I would love to hear how much the tooth fairy pays where you live? hehehe.....That did make me chuckle about your girl asking to be punched in the face to get the tooth out. We gave £5 for the front ones and £2 for the rest! We used to get 20p when we were kids, when I asked Mum why others in my class got £1 Mum said that we had a smaller tooth fairy and pound coins are too heavy for her! I'll be doing £1 when my girls lose their baby teeth. I might possibly go up to £2 for the larger teeth but no more. £20 is ridiculous! I remember I used to get I think 20p! I couldn't imagine getting £20! I couldn't help laughing at this - without condoning violence of course! And £20 for a tooth?! Even in a few years I can't imagine paying that. £20 is a bit ridiculous! I'd be happy with just £1 at that age! Mine have always had 50p, but the tooth fairy on our street is quite stingy and extremely unreliable ;) There is no way would they ever in a million years get £20!!! Omg ..... Anything over £1 is extreme....it's just a tooth! I used to get 20p. The tooth fairy and Father Christmas are two stupid traditions that I really hate lying about. Who was this ludicrous person that spent 20 pounds on a tooth that is insane! I used to get a pound at most so anything over this amount is ridiculous! We have not started with the toothfaiy yet. Boo hasn't got all her teeth yet so I dont even want to think about her losing them. But the toothfairy would definitely not pay £20 for a tooth!!! It would have to be a gold tooth for me to give them £20. I got £1 a tooth I believe and maybe my back teeth I got a couple of £2 coins. Mum just said the kid who got £20 is spoilt and I was happy with my £1 as a kid. I never got money from the tooth fairy because where I'm born our tooth visitor is Ratoncito Pérez who left us gifts instead of money. Money seems unusual to me as a gift to present to children. £20 for a tooth! They do have 20 to fall out. Now that would be expensive. Great post! I'd personally give a £1 or £2 but I did see Farrah gave her daughter £900!!!!!!! There is new thing I have learned! You pay for tooth fairly! Wow! in my country you give sweets but here money! Nice!